My shop takes up most of an attached 2-car garage. It has a concrete floor. Which can be a hazard to a woodworker. Why? First, there’s the issue of creature comfort. Standing on a cold concrete floor for more than an hour at a time leads to aching joints and muscles. Sometimes I just feel exhausted after spending an afternoon on concrete. Then there’s the issue of dropping things. Like tools that accidentally get knocked off a workbench. Or a workpiece that you’re ready to assemble onto your project. Concrete is less than kind to either of these items. For an edge tool like a chisel, it may mean a trip to the grinder or sharpening stone to remove dings or otherwise damaged edge. 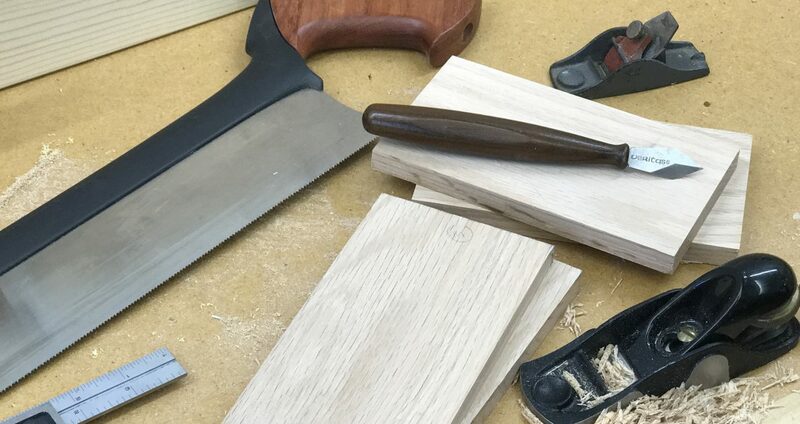 For a hand plane, it can mean disaster. I once accidentally bumped an old Stanley 71 router plane to the floor. It cracked. I was heartbroken. That’s why I’ve covered my shop floor around my workbenches with inexpensive floor tiles like you see here. There are many places online where you can buy them. The ones shown here are from Rubber Flooring Inc. I didn’t cover my whole shop floor — just the central work area where I spend most of my time. The tiles are easy to put down, aren’t that difficult to clean, and provide a couple of other benefits. First off, I can spend hours in my shop and not feel like I’m ready for a deep-muscle massage and a nap. The floor tiles also insulate my feet from the cold floor. This is especially helpful in the winter since my shop has very little heat. The biggest benefit for me is that the tiles cushion the blow from falling tools or workpieces. There have been more times than I care to recall dropping a chisel or other tool and silently cursing about the potential damage. It’s a heart-stopping moment when it happens. But the cushioned floor saves the tool or prevents dinged corners on workpieces. Oh…you’re shop floor is wood, you say? I’d still put down foam floor tiles. They’re more comfortable and softer than wood when cushioning a dropped item. Go out and buy some floor tiles. Now.